LaLiga, no rival in European football! There may be scheduling issues and problems with the organisation of its stadia, but when it comes to on-field matters there is no league on the planet that comes close to matching the quality in Spain. While people will debate it, the facts do not lie. Spanish football is more dominant than any other league and boasts more continental titles than any other nation in Europe. Whether you look at the Champions League, Europa League or the UEFA Super Cup, or individual awards like the Ballon d’Or or Golden Boot, most of their respective winners have been representatives of Spanish football. 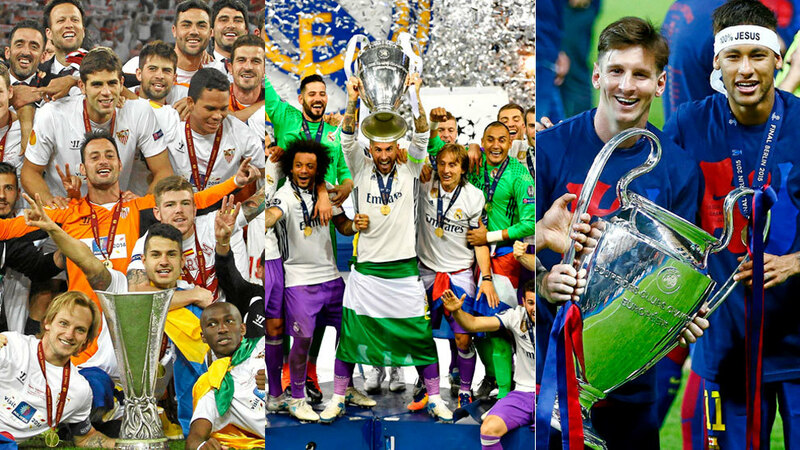 Starting with the Champions League, five of its last seven winners have been LaLiga teams. Real Madrid have won the last two, with Barcelona winning the previous year’s by dethroning Los Blancos, not forgetting that two of Real’s recent titles came in final victories over Atletico Madrid. Sevilla’s three-in-a-row in the Europa League put Spain ahead in recent years of Europe’s second club competition. Atletico’s triumph in 2012 means only Chelsea and Manchester united have won the tournament for any other nation in the last six years. The European Super Cup’s last three winners have been Real Madrid, Barcelona and Real Madrid again, each of these wins being against Sevilla, with Spanish sides winning 13 in total – four more than next best, Italy. On an individual level, since 2008 either Cristiano Ronaldo or Lionel Messi, with the Real star set to add another this year, have won every Ballon d’Or. Furthermore, the Golden Boot has been one by a LaLiga player in seven of the last eight seasons, with the one exception being Luis Suarez at Liverpool, who would soon after join Barcelona. LaLiga’s dominance cannot be questioned and year after year it further emphasises its superiority over any other league. With the world’s two best players, two best clubs and several others playing excellent football, Spanish football is still some way ahead of the rest.